Kadhi is one of the famous North Indian yogurt based gravy and its almost like our South Indian Mor Kuzhambu eventhough Kadhi goes for easy breezy preparation. I love making yogurt or curd based gravies often at home whenever i feel lazy to cook. That too Kadhi goes for quick preparation and they will take hardly less than half an hour to get ready, no chopping no sauting no frying just mix the gram flour to the curd, add water, spices, bring it to boil and temper it, see how easy is this. This Kadhi gole is different from the usual one, actually ground spiced channa dal shaped as small balls are dropped directly to the cooking Kadhi and later tempered with turmeric powder, chilly powder, coriander powder and with usual spices like mustard seeds, cumin seeds, curry leaves and chopped green chillies. Sounds very tempting na, yes we loved this delicious and definitely a fingerlicking kadhi gole with rice for our Lunch. Obviously you can see some ressembles like our paruppu urundai mor kuzhambu eventhough the spices are almost the same. Trust me this Kadhi gole is a very easy gravy which gets ready very quickly apart from the soaking time of the channa dal. This yogurt based channa dal balls gravy is this month's challenge for the Southern team of the South vs North Challenge an event owned by Divya Pramil.And the host from Northern Team Prerana Khanwalkar challenged us with this beautiful dish. This Kadhi is traditional dish which Prerana learned from her mother. Seriously this Kadhi rocks,thanks Prerana for sharing this traditional dish from Maharashtra with us.You can enjoy this kadhi with parathas,rice or rotis. Grind the soaked channadal with green chillies, ginger, garlic cloves with salt as bit coarse paste, dont add water if needed just go for few drops. Meanwhile mix the yogurt, 3cups water, gram flour, sugar and salt in a bowl . Heat a heavy bottomed large pan, pour this yogurt mixture to it, cook in simmer until the mixture startes slightly warm. Add the grated ginger, cook everything in simmer for few minutes. Now make small medium sized balls from the channadal mixture, drop it to the cooking kadhi. Wait for few minutes, drop the prepared balls one by one slowly without stirring, let the balls get cooked in simmer and wait until they starts floating. Now heat the ghee in an another pan, let splutter the mustard seeds, cumin seeds, add the chopped green chillies,curry leaves, red chilly powder,coriander powder, asafoetida powder,fry for few seconds, take care not to burn the spice powders. Add this tempering to the cooking kadhi, give a stir. 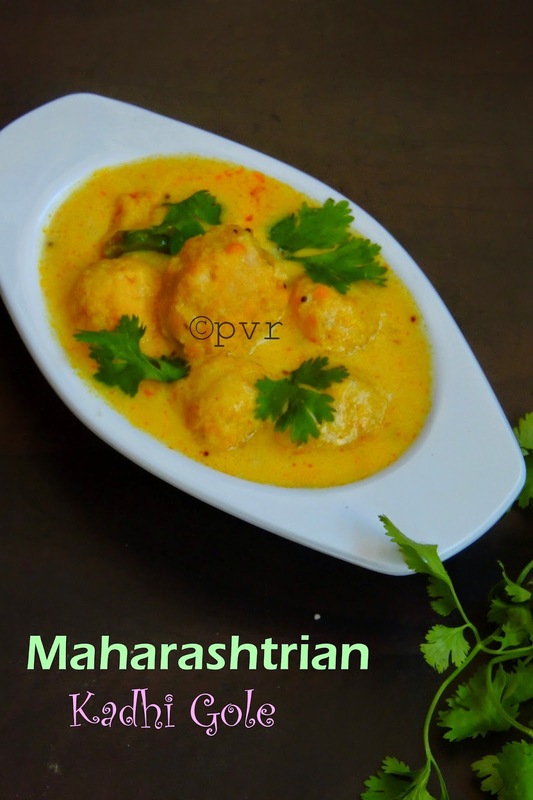 Remove the cooked channadal balls from the kadhi, break it in a bowl of plate. Heat a tablespoon of oil, let splutters 1/2tsp Mustard seeds, 1/2tsp Cumin seeds, 1/2tsp Red chilly powder,1/2coriander powder, 1/4tsp Turmeric powder and fry, pour the tempering to the channadal balls and serve. 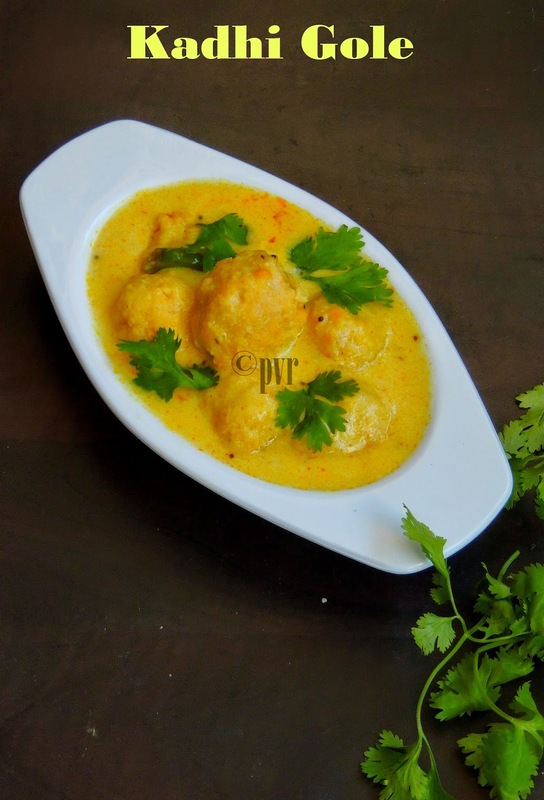 Serve the kadhi and this tempered channadal balls along with rice or rotis. so simple n tasty kadhi!! Delicious khadi aks, you have made it so well. Very tempting.